Compile data from a variety of sources collected by the Office of the Chief Medical Examiner during a death investigation. 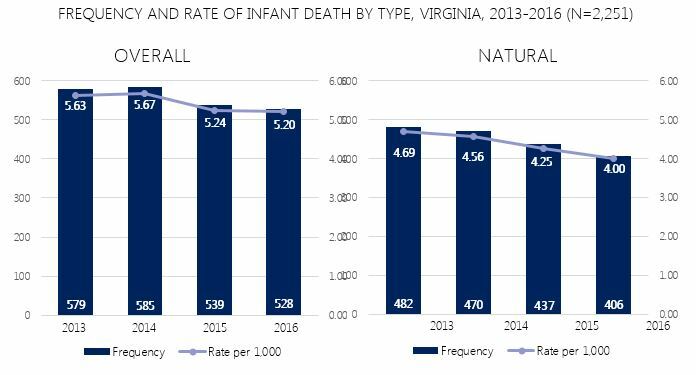 Identify risk and protective factors associated with child fatalities and examine how these factors influence child death in Virginia. Recognize vulnerable and special populations that may have a higher risk of child death. Inform, develop, and evaluate evidence-based injury and violence prevention efforts. Analyze trends in both natural and non-natural deaths of children aged 0-17. Provide a better understanding of injury patterns and the circumstances surrounding specific causes of child death. Guide and inform discussions, planning, and legislative action that affects the health and well-being of children and families. Educate policy makers, state and local agencies, community organizations, stakeholders and the general public about infant and child fatalities. 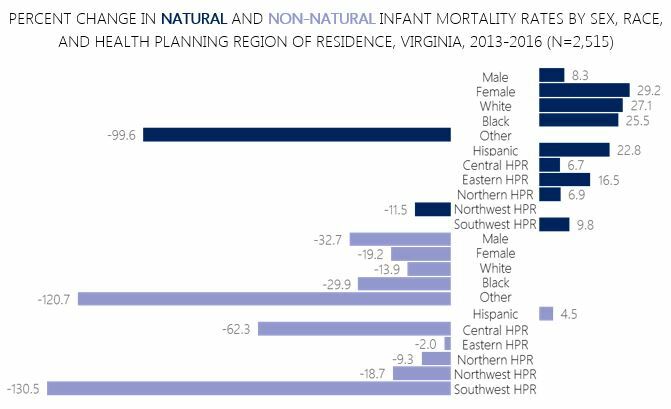 In Virginia, the overall infant mortality rate has continued to slowly decline since 2013, dropping from 5.63 to 5.20 deaths per 1,000 live births. The same holds true for the natural infant mortality rate, which declined from 4.69 in 2013 to 4.00 in 2016. 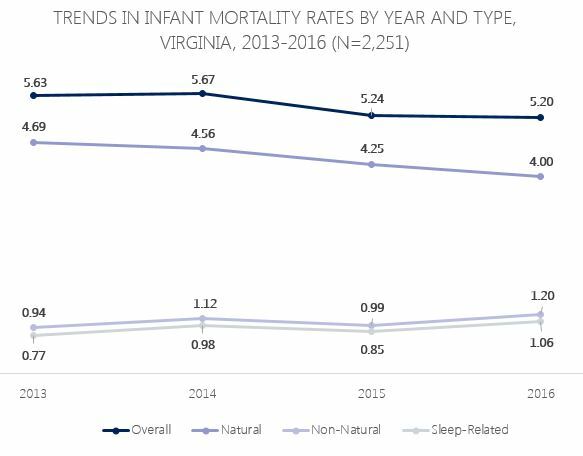 Despite the steady decline in natural infant death, the non-natural infant mortality rate rose from 0.94 in 2013 to 1.20 in 2016. The frequency and rate of sleep-related infant deaths also increased over the four-year period.